I am committed to restoring free tuition at Cooper Union. However, the restoration of free tuition must be done in a responsible, fiscally sound manner. There are number of colleges that provide an excellent education, but not many that provide an excellent education and free tuition. Cooper Union needs to be restored to its unique status. The greatest city in the world needs a free Cooper Union. I would be honored to serve if elected. 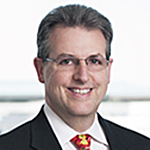 Bernie is a patent lawyer with McDermott Will & Emery in Washington, D.C. For the last 18 years, Bernie has managed the patent portfolios of and counseled large corporations and small inventors. He is admitted to practice law in the District of Columbia and Maryland and is registered with the U.S. Patent and Trademark Office. Bernie has worked for both the government and the private sector. Prior to joining McDermott Will & Emery, he was a patent examiner with the U.S. Patent and Trademark Office (USPTO) for 7 years. Before joining the USPTO, he worked 9 years as an engineer developing new products at a couple of battery manufacturers. Bernie is a proud member of the Cooper Union class of 1983 (Ch. E), and received his JD from the University of Baltimore Law School in 1996 while working full time at the USPTO. Bernie is a coauthor of the Patent Applications Handbook, published annually by Thomson Reuters. He has given numerous presentations on patents, including an LLM course at the Max Planck Institute. Bernie has written numerous patent law articles for McDermott Will & Emery’s monthly IP Update, AIPLA publications, and other publications. While in law school, he was an associate editor of the University of Baltimore Law Review and the manuscript editor for the University of Baltimore Intellectual Property Law Journal. Bernie provides pro-bono services to tenants facing eviction and small landlords at the Landlord Tenant Resource Center in Washington, D.C. Bernie was a Cubmaster and Scoutmaster for the Boy Scouts of America, coached youth sports teams, and a religious education instructor. Although he has lived in Maryland for over 30 years, he maintains close ties with the New York metro area, and visits NYC frequently.